Sorry for the lack of the promised Q and A featuretoday, friends! Something unexpected and very time consuming came up tonight and by the time I got back from dealing with it, I was too zonked to write one. BUT... here is a new comic all the same! Come back on Monday for the next one. Did you know: in the original strips, there were almost no shots of Sam and Fuzzy's apartment building from the outside? Prior to today's strip, I'm pretty sure this is the clearest view we ever had of the front door. To current me, that seems like madness... establishing a sense of setting is so important! But at least it means I've learned one or two things in the last 14 years. Also, unless I'm terribly mistaken, we never saw their actual apartment number. So I've made one up! (There was a reference to it being four floors up, though, which is why it's a 400 number.) See... we're learning SHOCKING SECRETS ABOUT THE PAST already! Come back on Friday for a new comic and a new round of reader Q and A. (If you have a question you'd like me to answer, just pop it in an email with "Q and A" in the subject line.) See you then! Hello, friends! 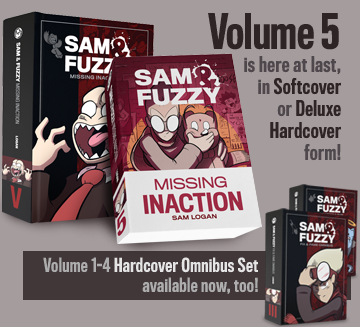 Today, we kick off a very special chapter called Sam and Fuzzy: Six Years Earlier! 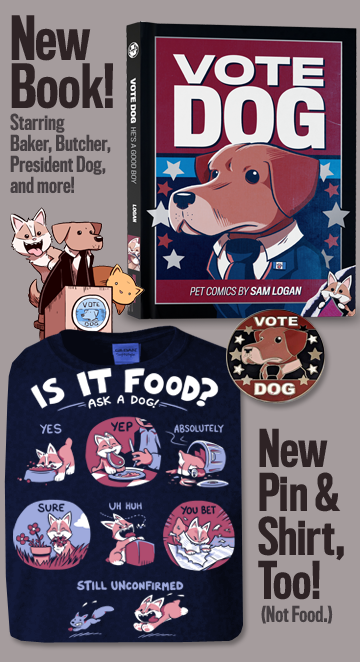 It's going to be an interesting one for a number of reasons, but the biggest hook is probably that it takes place during the "Classic" era of Sam and Fuzzy... that is, the era of the first four real-life years of the Sam and Fuzzy webcomic. I suspect that when we make the print collections, this story will become the (very large) first chapter of Volume 6, but it's really more of a stand alone side-story... a mini-volume between 5 and 6, if you will. But it has a lot of implications for Volume 6, and should also shed some light on some of what's come before, too. I hope you enjoy it!